Looking to buy lunch for under $10? Well look no further because I have 13 great places for you! These places were chosen because the majority of the menu was under $10, giving you lots of options and variety. I did not get a drink with my meal and I have not included a tip in the total amount. Food trucks were not included (they’re worthy of a post on their own! ), nor restaurants with table service (because you need to have money left to tip your server). Between these options, you’re sure to find something you’ll love! College students watch their money, so take a note from them and visit Cosmic Cantina off Ninth Street by Duke University. Cosmic claims to be the “Best Mexican Food on the Planet” which sets a high bar! You can order just about anything off the menu and stay well within budget. I ordered the chicken burrito. It came with a side of chips and salsa. (I didn’t realize that and ordered a separate chips and salsa, which is really meant to be shared!) My total including tax (and with the extra chips and salsa) was $9.44. There were plenty of options on this menu that would allow you to buy a drink as well. I’m not suggesting a bagel with cream cheese (although if that’s what you’d like, they have great options!). The Bagel Bar, located across from City Hall, offers plenty of sandwich options that will fill you up. I ordered an open-faced sandwich appropriately called Best Melt Ever, with bacon, spinach, tomato and cheddar (one of their pricier items on the menu). My total with tax was $8.06. With quick service, this is a great place if you’re short on time. BONUS: Use your Shop Durham card to get buy 1, get 1 free sandwiches! Almost everything on this menu should allow you to stay within budget. Based on the suggestions of some regulars, I ordered an all beef hot dog, a fried bologna sandwich, and a side of tots. The total, including tax, was $9.86. The cheapest item on the menu is the red hot dog for $1.95. Turn any item into a meal by making it a combo for $2.99, which includes a side and a drink. So you could have a complete meal for just $5.31! Great service and fun attitude make this a popular locale. I debated adding Loaf to this list because the only “lunch” type item they sell is their flatbread (think pizza) for $4, although some days there may also be quiche or a savory pastry (like a ham gruyere croissant). But once I considered you could also buy dessert while you’re here, well that changed things a bit! My lunch of an asparagus, turnips, arugula pesto and gruyere flatbread plus a chocolate chip cookie totaled $5.70. There’s nowhere to sit down but Loaf offers you an opportunity to get something salty and sweet for under $10, plus their staff is super friendly and willing to give suggestions! Their meal offer is just over $10 when you add taxes, but if you order three empanadas with a side and a water, you’ll be fine. I ordered one of each of the beef, spinach, and pork empanadas with a rice and beans side. My total, including tax, was $9.68. And how can you not love a good story of childhood friends from Argentina who decided to share their favorite childhood food with us Durhamites? Monuts has come a long way from its beginnings selling from a tricycle near Durham’s Farmers’ Market. While Monuts became famous for their donuts, they offer a nice breakfast and lunch menu at their current location based on both seasonal and local food items. Most menu items are $8, although I have a fondness for the chilaquiles at $9 ($9.68 including tax). The lunch special allows you to buy 2 tacos with a side of rice and pinto or black beans plus a soft drink or iced tea for $7.75, which with tax will total $8.33. If you’d rather have more food and don’t need a drink, their 3 tacos plate costs $7.95 ($8.55 with tax). If you come as a group, share a $3 chips & salsa! Order one of the specialty sandwiches for $8.95, which come with baby carrots or chips. The regular sandwiches are $7.95 or less. This bakery also serves rotating specials for $7.95. A few items cost less than $4.95 and you can add a side salad for $2. With tax, my “Little Rocket Man” specialty sandwich, featuring Korean barbecue, came out to $9.62. My favorite time of the year to visit is the summer because their gazpacho is ah-mazing! 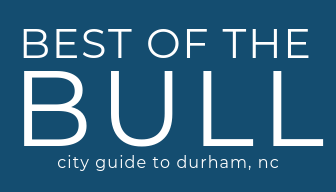 Download the free Best of the Bull App for your complete local guide to Durham! This popular business started out as a food truck and became so popular that it now has two locations! The basic burger costs $4.99. I also ordered their large fries (because, well, they’re delicious!) and my total including taxes was $8.58. You can order one of their specialty burgers but adding an order of fries will put you over $10. Of course if you have a friend with you and you share your fries . . . This quirky sandwich bar inside a store should be on everyone’s list of places to go in Durham. You can’t go wrong with anything you order. I ordered the shrimp BLT, the most expensive sandwich at $8.99 which brought my total to $9.66, including taxes. I’m also a fan of the pimento cheese (with bacon) sandwich! Each sandwich comes with a side of coleslaw. And for those who want something other than a sandwich, order a platter including a protein and two sides for $8.99 or three veggie items for $7.99. So you can’t order a full pizza, but you can get a slice and a side for just under $10. Depending on which toppings you choose, you can get a slice of pizza for $3 or $4. A side salad costs $5, although you can have your salad added on top of your slice for $3. If you prefer wings, you can get a pound for $9. But in my opinion, the best item on their menu are their Brussels Sprouts, which come with an aioli sauce for dipping! Yum! I ordered a slice of pizza and a wedge side salad which came out to $9.68 with taxes. No, I’m not suggesting donuts for lunch (not that there’s anything wrong with that!). I ordered the Savory Buffalo Biscuit Sandwich with hashpuppies (think jumbo tots rather than hushpuppies) for $7.50 ($8.06 with tax). But you could also order the Righteous Chicken Strips for $5.95. For comparison purposes, each strip is made from half a breast used in the sandwiches, so that’s a terrific deal. You can put them on a garden salad for $6.75. The juicy chicken with a tangy sauce is perfect. Plus the hashpuppies are made with cheddar cheese! At these prices you’ll have enough for a drink! Having five locations, Saladelia offers Mediterranean flavors, whether you’re downtown at the American Tobacco Campus, on University Drive, or at three locations on or near Duke Campus. Saladelia offers the greatest variety of choices for under $10, including salads, sandwiches and wraps, and entrees. I ordered a fried green tomato sandwich which cost me $7.73, including tax. If you want to make it a combo, add a side for $2 and a drink for an additional $1. So what is your favorite place to get lunch for under $10 in Durham? Where have I missed? Be sure to download our free Best of the Bull app for your local guide to Durham plus discover the rewards you can enjoy with our Shop Durham program. Ten years ago, I took a job I love as an attorney in downtown Durham. Watching Durham grow as an exciting and vibrant city has been a joy. I especially love sharing my favorite local haunts with others. There is so much to do in Durham that I feel everyone should be let in on our little secret! Visit The Common Traveler for more travel tips for Durham and beyond. Welcome to Durham, NC- Happy 150th Birthday!